Chaozhou City (cháo zhōu shì 潮州市) is in the east of Guangdong Province (guǎng dōng shěng 广东省). It lies in the middle and lower reaches of the Hanjiang River (hán jiāng 韩江). Chaozhou covers an area of 3,613 square kilometers and has a coastal line of 136 kilometers. 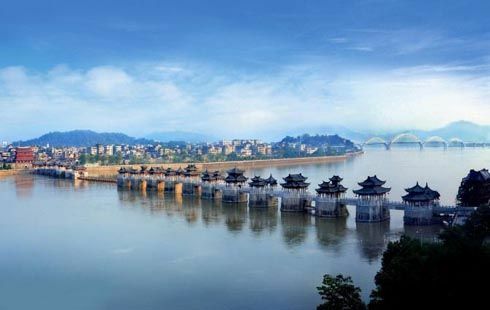 It is a famous national historical and cultural city in South China, the renowned Qiaoxiang (qiáo xiāng 侨乡) and a tourism city opening to the outside World, the Porcelain Capital in China, the famous town of Chinese evening wear and the hometown of Chaozhou Cuisine. Foshan City (fó shān shì 佛山市) is in the southwest of Guangdong Province (guǎng dōng shěng 广东省), 28 kilometers away from Guangzhou City (guǎng zhōu shì 广州市). With a population of 320,000, Foshan is one of China’s oldest pottery towns. It is in the central area of Zhujiang Delta (zhū jiāng sān jiǎo zhōu 珠江三角洲), the north to it is Guangzhou, the west to it is Zhaoqing (zhào qìng 肇庆), Zhuhai (zhū hǎi 珠海) is in the east and Jiangmen (jiāng mén 江门) is to the south. Zhaoqing city (zhào qìng shì 肇庆市) is located in the west-central of Guangdong province (guǎng dōng shěng 广东省), it is a beautiful city with a long history of more than two thousand years. Zhaoqing City covers an area of 15,000 square kilometers, with a population of over 3.9 million. In the Qin Dynasty (qín cháo 秦朝)(221BC-206BC), this area belonged partly to the Nanhai Shire. In the Sui Dynasty (suí cháo 隋朝) (581-618), it was called Duanzho(duān zhōu 端州) and then changed into its present name, Zhaoqing, in the Song Dynasty (sòng cháo 宋朝)(960-1279). 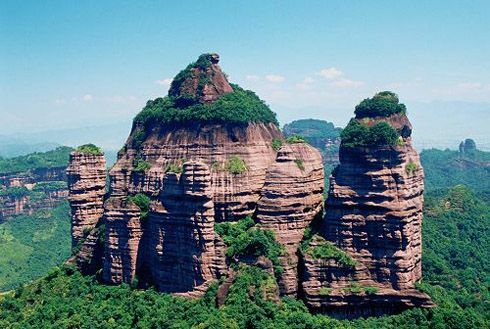 Danxia Mountain (dān xiá shān 丹霞山), also called China Red Stone Park (zhōng guó hóng shí gōng yuán 中国红石公园), is located in Shaoguan City (sháo guān shì 韶关市). 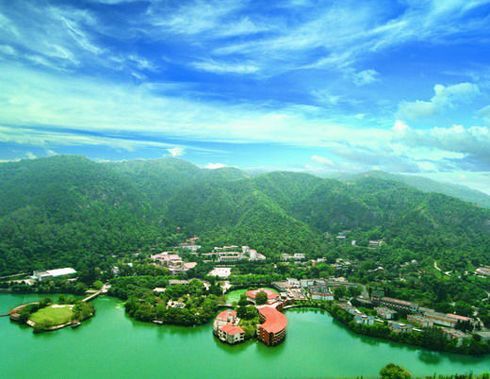 It covers an area of 290 square kilometers, which is one of the most famous mountains and regardes as the most beautiful scenery in Guangdong Province. Since 1988, Danxia Mountain has been successively appointed as National Scenic Spot, National Natural Protection Zone for Geology and Geomorphology in China, Grade AAAA National Tourist Spot, and National Geological Park of China. 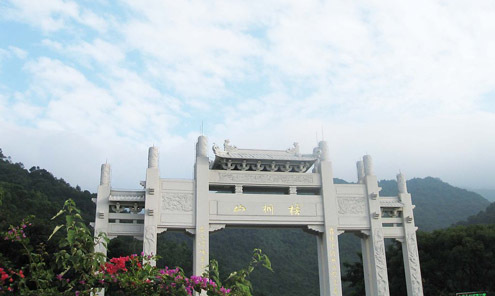 Wutong Mountain (wú tóng shān 梧桐山) is located in the east of Shenzhen (shēn zhèn 深圳) special economic zone. It is the tallest mountain in Shenzhen. Wutong Mountain covers an area of about 32 square kilometers. 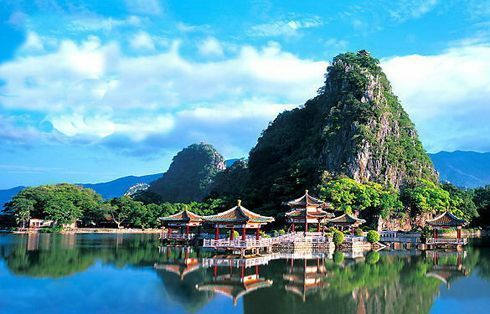 In May, 1993, the Guangdong Provincial Government awarded the mountain as provincial scenic spots.